Yahoo Finance's Tech Ticker reports that Reports of Oil Boom's Death Look Premature. Rob at Entropy Production thinks the oil market is getting ahead of itself ( Things That Make You Go Hmmm...) - according to his MORON model the price should be closer to $95 a barrel. Reuters reports that the US and UK have launched probes into oil price manipulation. WOWOWOW wonders if the surge of investment funds into commodities is the prime cause for rising oil prices - Institutional Investors: The 'Dark Force' Driving Oil Prices Sky High?. The Economist thinks that neither speculators nor peak oil theorists are to blame for high oil prices, and that market forces are resulting in increased supply and decreased demand. They claim that oil production will grow by 3 million barrels per day over this year and next. We'll see if that is any more accurate than their prediction of oil sinking to $5 a barrel back in 1999. The Economist also reports that oil production in the North Sea is falling faster than predicted, though Aberdeen remains prosperous courtesy of sky high oil prices. One more from the Economist, this one on a carbon neutral clothing factory in Sri Lanka. Renewable Energy World has a post on the Severn Tidal Power Study Moving Ahead, with the UK energy minister noting it could meet 5% of UK demand. The Daily Telegraph reports that Scotland has its first tidal power generator up and running - Tidal power fuels Britain's National Grid . Scoop reports that the New Zealand Government is funding a tidal power project in Kaipara harbour. The ABC reports that Air New Zealand is planning a trial flight using a biofuel derived from jatropha later this year - Air New Zealand to trial new bio-fuel. The New York Times has a report on a cooling tower collapse at a nuclear power plant in Vermont. Apparently some unusual cattle have been observed in the local area. The NYT also notes that cost continues to make clean coal a mirage - Mounting Costs Slow the Push for Clean Coal. One more from the NYT - an article on armed bandits stealing used grease from restaurants (and Burger Kings) - As Oil Prices Soar, Restaurants Learn to Lock Up Old Grease. Grist has a post on Slave ethanol, noting an mnesty International report on forced labour in Brazil's sugarcane fields. Inhabitat has a report on Apple's new patent to build thin film solar cells into computer screens. 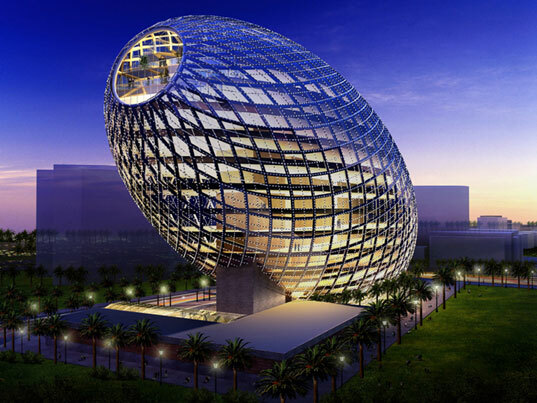 Inhabitat's funky green building of the week is this ‘Cybertecture Egg’ for Mumbai, due for completion in 2010. Jamais at Open The Future has a post on the politics of geoengineering - Who gets to determine the "right" climate for the Earth?. Alex at WorldChanging has a post on The Real Green Heretics, rebutting some of the silliness in Wired's issue on "inconvenient truths". 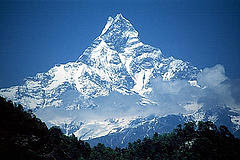 The Daily Telegraph has a series of articles on biomimicry - Natural leaders. The Asia Times claims that Bush is planning an air strike on Iran by August. The Washington Post reports that ex-Bush spokesman Scott McClellan has outed the "sophisticated propaganda campaign" used to mislead the US into the Iraq war. Cryptogon has an entertaining rant about a British plan to introduce carbon rationing - Every Adult in Britain Should be Forced to Carry ‘Carbon Ration Cards’ (according to The Daily Mail anyway). While I think if you objectively consider trading carbon taxes for income tax cuts you'll decide its a good thing - but carbon rationing is over-the-top from my point of view. Cryptogon also reports that Children in Katrina Trailers Provided By FEMA May Face Lifelong Ailments.